It’s got explosions, near accidents, sprints, anger, tears and more yet this a documentary film that invites meditation on the state of pro cycling. If you’re the type who acts first and thinks later then you might find yourself on a flight to Colombia very soon with your bike sitting in the hold below. If you’re not familiar with the Morton brothers then a reductive recap: Lachlan and Angus (“Gus”) are pro cyclists. Lachlan was noted for his prodigious talent and turned pro five years ago with the Garmin-Sharp team. Only the strictures of the World Tour were too much – perhaps he was too young as well? – and once his contract was up he stepped away from the sport. 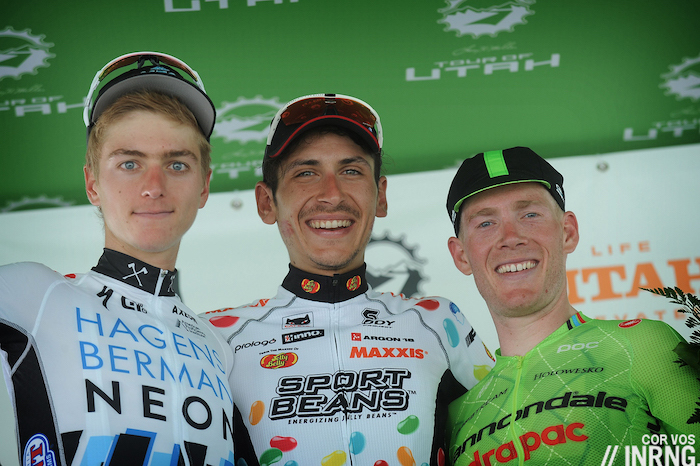 In time the brothers joined the US Conti team Jelly Belly and Lachlan won the Tour of Utah last summer, beating Andrew Talansky to the title. Along the way Lachlan and Gus have made two films, travelogues where they take on challenging rides and the premise is to explore the terrain and the people along the way as well as to look inside themselves and reflect on what cycling can be about. Thereabouts 3 reprises some of these themes as the Mortons visit Colombia to ride across the Andes and experience the country’s culture for themselves. It’s told in a film just over an hour long that’s a travelogue as the landscapes roll by and they meet the locals in bars, cafés, out on the roads and even in the fields when they share some guarapo, an alcoholic drink, straight out of an improvised cup. This is all satisfying as they embrace local culture. Nobody is stopping for a Starbucks or a Subway here and there’s not an energy gel in sight. Colombia remains a mystery in pro cycling’s pyschogeography: a land where cyclists come from rather than go to. Flanders, the Alps and the Pyrenees get plenty of coverage as destinations but Colombia’s cycling culture is just as vibrant. Colombia is on another level, literally given the altitude which makes it hard to pop over for a week but also conceptually because it is exotic with rainforest and even mythical as the land that produces so many champions. If Flanders has its Flandriens then Colombia seems to churn out the climbers and it celebrates them too. The film passes through Tunja and Nairo Quintana’s bakery. The roads seem full of escarabajos, the slang term – literally “beetles” – given to Colombian climbers. The Mortons are out to explore and there’s a film crew in tow. At times the director is in charge, his route planning sees the riders rise before dawn and tackling unthinkable climbs which pushes the pair to the edge which is part of the documentary’s purpose, to leave comfort zones behind. If the director sometimes features on screen the Mortons and Colombia are the stars. The brothers just seem to be out doing their own thing, happy to interrupt a ride to play tejo in their bib shorts, to walk into an onion field to meet workers, or down shots of something potent with local traders in a bar in the early morning. Of course they do because an hour of men pedalling wouldn’t make for a good film but the encounters are enjoyable and even the shots of the Mortons riding are fun given their frequently changing outfits. The juxtaposition of Lopez and the Morton brothers highlights the differences as the brothers are out for a ride, Lopez is on a communications exercise. Just as you begin to feel cynicism about Lopez’s manager muscling in you see the Mortons chatting with the local cyclists all in their club kit and it’s heart-warming. It’s amusing too as they learn the two Australians are not gringo journalists in town for Lopez but actually there to ride and slowly they discover Lachlan won the Tour of Utah. Along the way there are lot more meetings and exchanges and any language barrier just gets bunnyhopped. A meeting with the Manzana Postobon team for example is more instructive as the managers explain their team and rider Juan Pablo Villegas explains his story which deserves to be told, heard and learned from. There’s a lot to take in which makes watching this a few times enjoyable. You can start with the travel, you can take notes on rural life in Colombia, think about pro cycling or maybe reflect on why you ride. However as much as the Mortons represent the notion of freewheelers on a journey, they’re still doing it with a film crew in tow and the director is influential, this is not just two brothers out for a ride, it’s not strictly a documentary. There’s also some product placement going on but it’s subtle rather than forced and feels acceptable, a price to pay to get the film done. Enjoyable as a travel documentary that explores Colombia and Colombian cycling, this shows the country’s raw appeal with dusty roads and big trucks, it’s no tourist promo but it still entices thanks to the locals. Don’t be surprised if you find yourself looking up travel to Colombia and potential routes around Boyaca and Antioquia and if not, just wondering whether you can pull off the T-shirt look. The Morton brothers are always of interest and their take on cycling is refreshing, a reminder to just ride for the sheer fun of it. The film is available to rent or download on Vimeo. A good investment of theirs; your free view translates to many paid views from your many followers. Sure, it’s bound to help. Sometimes I get books expressly as review copies and if there’s a review there’s the note to mention this; here the film was just shared. Hopefully people who didn’t find this film on their radar can learn about it and see if they’re interested. Thanks for sharing this – a timely reminder. 17€ of good investment I think. Agreed re: 1 and 2. I didn’t like 2 anywhere near as much, for the same strange feelings regarding the ending so I was gonna steer clear of this one. So thanks to INRNG for the review and to CyclingTips for sharing. I thought this film was great, I really enjoyed it, and I enjoy their distinct approach to the sport – they’re the opposite of most PR-controlled pro athletes. They’re obviously serious about being pros, but they still seem to approach cycling and travel with the same love and sense of wonder like ordinary, passionate hobbyists. This film was better than the 2nd one, which had some great additional protagonists (Taylor Phinney, Cam Wurf) and storylines, but felt a little too… produced (which I think the Morton brothers have agreed to in subsequent interviews). I’m not quite sure they’ll be able to get back to the level of first one though, which really felt the most genuine, inside and out, in terms of spontaneity, production, and story. Thanks for the review; I’ll definitely give it a watch (which I would not have done in the absence of this post). “a reminder to just ride for the sheer fun of it.” – To me this is the most important thing in what we do when out on our bikes – despite our describing it as Suffering. I have been reminded of this lesson repeatedly (almost every day, in fact…) in recent weeks as I watch the sheer, utter joy on the face of my 4-year as he whizzes around our neighborhood on two wheels. Truly this is a wonderful machine! As much as I envy these professional riders and their accomplishments, I think I am happy not to view my bike the same way I view my desk at work. I remember hearing about this on The Cycling Podcast​ a year or so back. Thanks for the reminder. Also, random 90s reference, Lachlan Morton is the double of the good guy/horror nerd from Scream.